The following article nicely consolidates historical and nutritional information, as well as seaberry’s folk uses in treating different health conditions. This information should be taken in context of the synergies provided by consuming the whole fruit, because as with anything, isolated and concentrated components can impede benefits otherwise present in the whole food. Sea buckthorn (Hippophae rhamnoides) is one of the important natural resources of the mountainous regions of China and Russia. The plant grows naturally in sandy soil at an altitude of 1,200-4,500 meters (4,000-14,000 feet) in cold climates, though it can be cultivated at lower altitudes and into temperate zones. Recently it has been extensively planted across much of northern China, and in other countries, to prevent soil erosion and to serve as an economic resource for food and medicine products. For example, Canada has invested in planting sea buckthorn, originally brought over from Siberia in the 1930s, hoping to develop a good agriculture market; Saskatchewan has ideal growing conditions, yielding a high quality product. The flavonoids of sea buckthorn (mainly from fruit pulp; also in the leaves) and the oils of sea buckthorn (primarily in the seeds, but also in the fleshy part of the fruit) are the two items specially extracted for medicinal use. Thus, for example, a flavonoid extract product is commonly produced that contains 80% flavonoids, with 20% of residual oils, vitamin C, and other components. Sometimes the flavonoid extract is combined with an oil extract; for example, a flavonoid-oil capsule (made from flavonoid extract and oil extract blended together in a soft gelatin capsule) is produced for use in treating cardiovascular disease. 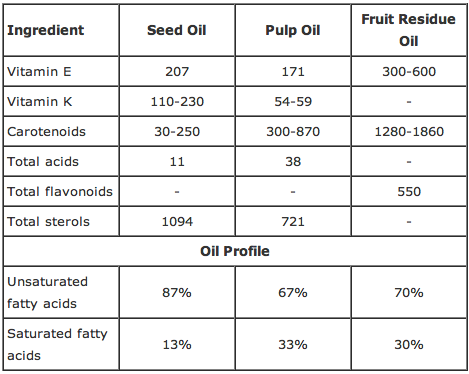 Main Constituents of Sea Buckthorn Oils from Seed, Fruit Pulp (juice), and Fruit Residue After Removing Juice. 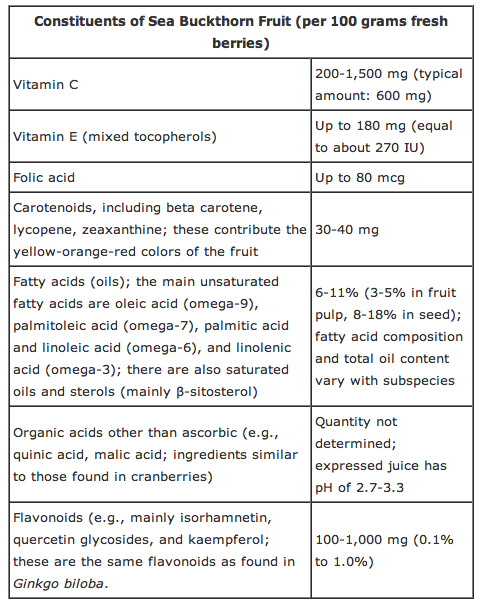 Figures are in milligrams per 100 grams or in percent (as indicated for breakdown of fatty acid composition). The fruit residue, which includes the outer peel, is rich in the colorful carotenoids and vitamin E; the seed has the highest level of the unsaturated fatty acids and sterols. Sea Buckthorn has been developed into a major resource for China. The main organization overseeing and promoting its utilization is the China Research and Training Centre on Sea Buckthorn, which has given rise to the International Center for Research and Training on Sea buckthorn (ICRTS). Many northern Chinese areas have become virtually treeless, even though they were once forested. Soil losses have been huge, and several previous attempts to grow various trees to hold down the soil have been unsuccessful. Sea buckthorn has turned out to be useful because it withstands severe weather and grows huge root systems in poor soil (and fixes nitrogen in the soil). Its planting and maintenance is encouraged by the local people who can earn income from harvesting the fruits (and other parts of the plant). It was noted by ICRTS that in the Loess Plateau of northern China (see map), annual topsoil losses are about 1,600 million tons. Downstream effects include an annual accumulation in the Yellow River of 400 million tons of sediments. Sea buckthorn now covers more than 200,000 hectares (500,000 acres) in the Loess Plateau. Of 360 bird species known to live in the region, 51 entirely depend on sea buckthorn as food and 80 are relatively dependent upon sea buckthorn. For many of the other animal species, sea buckthorn is an important source of food or provides shelter. The leaves and tender branches are a rich source of protein (11-22% by weight). A similar project was successfully developed in Mongolia where former attempts to use astragalus as the economic plant to stabilize the soil failed, while hippophae succeeded. Having confirmed that sea buckthorn was the most competitive species for the purpose of controlling water losses and soil erosion, a total of 67,000 hectares (166,000 acres) of sea buckthorn forest were planted in Jianping County of Liaoning Province. This helped to increase the vegetation cover from 4% in the 1950s to 34% in the 1990s. Run-off was reduced by 90% and soil erosion declined by 70%. Fodder, fuel wood, and berries contribute to local economic development (up to 3 tons of fresh berries can be collected on every acre of sea buckthorn forest). Several wild animal species have found a habitat in the sea buckthorn forest, including pheasant, hare, and fox. 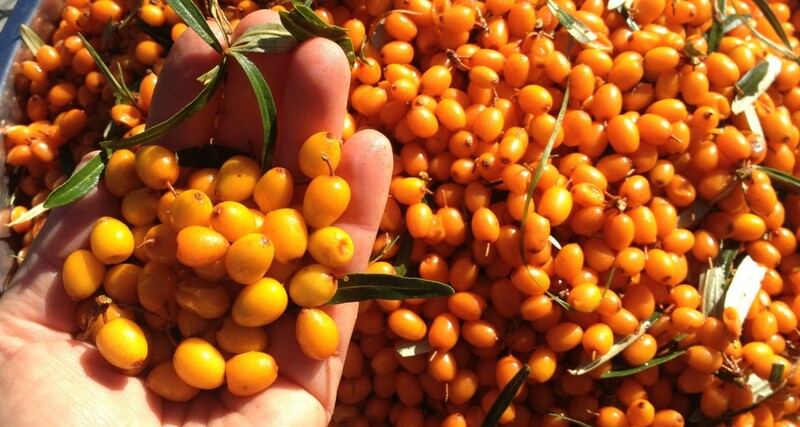 Altogether, China now has over 1.5 million hectares of sea buckthorn, 40% of it natural, the rest planted. There are over 200 processing plants for sea buckthorn in China. Following is a diagram of a processing method that can be used to separate useful components of the berries, yielding the key products of juice, dried fruit nutrients, and oil from the seeds and pulp; residues can be utilized as valuable animal feed. New technologies, involving supercritical carbon dioxide extraction, are now being used in China to efficiently produce the oil products. Rosch D, et al., Structure-antioxidant efficiency relationships of phenolic compounds and their contribution to the antioxidant activity of sea buckthorn juice, Journal of Agricultural Food Chemistry 2004; 51(15): 4233-4239. Xiao Z, et al., The inhibitory effect of total flavonoids of hippophae on the activation of NF-kappa ﬂ by stretching cultured cardiac myocytes, Sichuan University Medical Journal 2003; 34(2): 283-285. This entry was posted in Benefits and tagged Vermont Seaberry Nutrient Content. Bookmark the permalink.